History: In times before and after the collapse of the Soviet Union, Siberia was a hostile environment reserved for only the strongest. This is where Piotr Rasputin was born and where the seeds of his strength were sewn. While much of his life has been guided by strength, his decisions on how to use it have often influenced his circumstances the most. He is the middle child of two Siberian peasants and is a descendent of communist officials from the Stalinist era. Shortly after the disillusion of the Soviet Union, his parents acquired land from a former collective farm. Piotr spent most of his early life working this farm along with his older brother, Mikail. But while he worked the fields, his parents struggled to hold onto their land in the chaotic post-Soviet era. This created tension throughout his family that tested his strength early on, but Piotr endured. He often kept to himself, becoming isolated and stoic. That changed with the birth of his sister, Illyana. With their parents constantly struggling, he took it upon himself to raise her. They became very close and he often took it upon himself to protect her. But poor harvests and increasing pressures from the state put too much pressure on his parents. They became distant and began abusing alcohol. To help his family and Illyana, Piotr decided to get a job in a nearby coal mine while Mikail enlisted in the Russian Army. It was dangerous work, but it helped keep the family together. That all changed when an accident in the mine revealed Piotr’s true strength. At the age of 16, he was caught in a significant collapse in the mine that killed over 15 miners. But in being buried underneath tons of heavy rock, his mutant powers manifested. His skin turned to metal and he gained great strength, so much so that he was able to dig his way out where he was greeted by a very relieved Illyana. However, this relief was short lived. After being exposed as a mutant, he faced harsh treatment from his fellow miners and community. They were either afraid of him or disgusted by him. He ended up losing his job at the coal mine. Without the extra money, they lost their land and were reduced to wage earners once more. Shortly after, his father was hospitalized with liver disease, a direct result of his drinking. He died only a few weeks later. His mother soon followed, having also developed severe health problems from drinking and smoking. After burying their parents, Piotr and Illyana moved to Volgagrad where Mikail was stationed. However, the time he spent in the Russian army had hardened Mikail to the point where he became withdrawn and detached. Not much is known about what happened to Mikail, but Piotr made sure it didn’t happen to Illyana, who struggled to cope with the death of their parents. They moved into a dilapidated apartment where Illyana attended a local school while Piotr worked in a factory. But like the coal mine, the brutal conditions forced him to rely on his inherent strength once more. One day, he got his arm caught in a heavy press. Instinctively, he shifted into his metal form, protecting him and then breaking the press. This saved him, but enraged the plant’s manager. He told Piotr that he would now have to work off a debt and if he didn’t, he would harm Illyana. This angered Piotr so much that he grabbed the man by the neck and threatened to snap it if he dared harm his sister. The plant manager got the message, but so did the Russian Mafia. The plant he had been working at also happened to have connections with the mafia, which had grown in power after the collapse of the Soviet Union. And one of the plant’s associates reached out to Piotr and introduced him to Arkady “Omega Red” Rossovich, leader of the Omega Family and one of the most dangerous organized crime figures in the world. When he saw what 18-year-old Piotr could do, he was so impressed that he offered the young Russian a chance to become a courier. After finding out about all the money he could make, Piotr agreed for the sake of his sister. For the next year or so, Omega Red had Piotr go through training with former soldiers in Russian Special Forces such as Spetznaz. This was meant to harden him even more while teaching him to fight. It is here where Piotr gained most of the muscle mass that would later define him. It is also here where he learned to fight back against anyone who stood in his way. This earned him the nickname, Colossus. Such skills made him deadly, but Illyana kept him from becoming a monster. 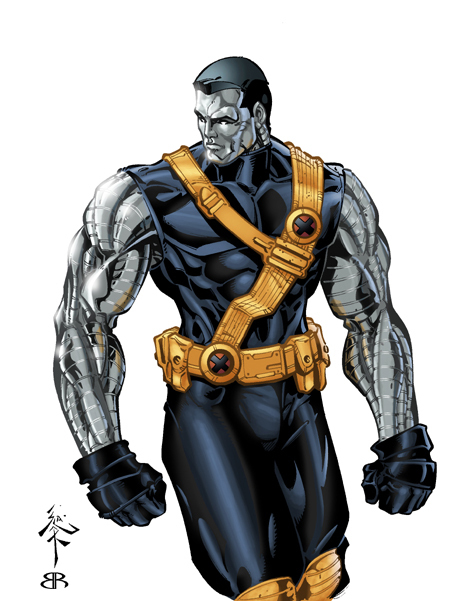 Once trained, Colossus became Omega Red’s most trusted courier. He was trusted with delivering the most precious cargo for the Omega Family, be it drugs or rare artwork. He never failed, which earned him money and preferential treatment by Omega Red himself. As he worked, he paid for Illyana to attend one of the best private schools in Moscow. But as she came of age, she realized what Piotr was doing and often criticized him for it. Eventually, it became a major source of tension, but it wasn’t enough to make Piotr give it up. That changed again when Illyana started showing strange symptoms. Piotr soon realized that these symptoms showed that Illyana was a mutant as well. However, her powers were unstable. She gave of mysterious flashes of energy and sometimes randomly disappeared and reappeared in strange places. Nobody at the school or with the Omega Family could figure out how to help her. And when it became clear that he needed to take more drastic actions, he decided to leave the Russian Mafia. After aiding Omega Red one last time in a failed deal with Shaw Industries in Panama, Piotr reached out to Magneto on Genosha. He claimed he could help his sister and in return, Piotr would help Magneto with a new plan. Illyana once again despised his brother’s decisions, but he continued to justify it. His mistake became all too apparent when he helped Magneto unleash the Cambrian. He was so horrified by his actions that he helped the X-men defeat him. Once the Cambrian was vanquished, Piotr sought help from Professor Charles Xavier, who offered him a place with the X-men. Now jaded from his former life, he agreed to join. Professor Xavier also helped Illyana by introducing her to Shaman and the Seftons, who discovered a mystical component to her powers. Now Piotr is seeking to build a new life and a new identity with the X-men, making new friends such as Kitty Pryde and putting the skills he learned in the Russian Mob to a more noble use. Character Breakdown: Piotr Rasputin is a man of physical and mental contrasts. He has a physically imposing presence, but he is also gentle with those he encounters. He is also mentally strong, having endured the loss of his parents and the hardened training of the Russian Mafia. However, he remains compassionate and caring. In a sense these contrasts are not unlike those of his metal skin and his regular human flesh. One is strong and the other is vulnerable. Piotr’s persona seems to have struck a balance between these contrasting traits. For most of his life, Piotr has had to rely on his strength to survive. The death of his parents and the work he did with the Russian Mob forced him to become tough enough to confront dangerous situations and equally dangerous people. And because of his strength, he has been able to endure and harden himself to these circumstances in both a literal and figurative sense. He is able to witness bloodshed and violence without becoming consumed by it. He is also willing to resort to violence, using both his strength and the skills instilled in him by the Russian Mob to do what is necessary. But what keeps him from becoming consumed by violence is his compassion. That compassion is embodied in the love he has for his sister, Illyana. She represents an innocence that he spent much of his life trying to protect. She helped keep him vulnerable despite his imposing strength. He took it upon himself to help her after the death of their parents. In doing so, however, he demonstrated a willingness to deal with dangerous people, such as Omega Red and Magneto. He was able to justify his actions, but not in a way that would compromise his compassion. And now that Illyana has come of age and is better able to protect herself, he has no means of justifying his previous actions. So long as his compassion remains intact, the balance between strength and vulnerability will be Piotr’s defining trait.